JAMESTOWN, N.Y. — Kieffer Bellows (Edina, Minn./Portland Winterhawks), Josh Norris (Oxford, Mich./Univ. of Michigan) and Riley Tufte (Ham Lake, Minn./Univ. 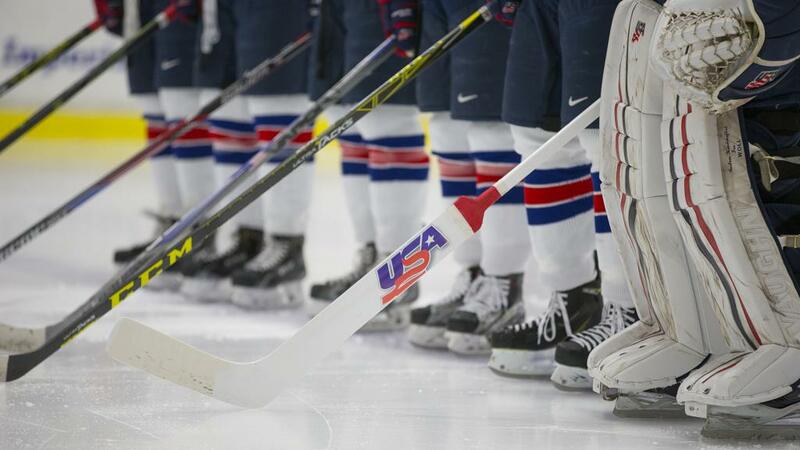 of Minnesota Duluth) each scored twice as the U.S. National Junior Team blanked Belarus, 14-0, in its first pre-tournament game ahead of the 2018 International Ice Hockey Federation World Junior Championship. "This was a great team win that, at times, really showed the style of play we want to execute in Buffalo," said Bob Motzko, head coach of the 2018 U.S. National Junior Team. "We’re looking for good detail and habits in little parts of our game and I think we can pick a lot of good things out of this game. As a staff, we have some difficult decisions to make here as we look ahead to Sweden on Friday and get closer to finalizing our roster." The U.S. National Junior Team will close pre-tournament action on Friday (Dec. 22) when it takes on Sweden at the Erie Insurance Arena in Erie, Pa. Puck drop is set for 7 p.m. ET and will be streamed live on HockeyTV.com. Tickets are on sale now here. 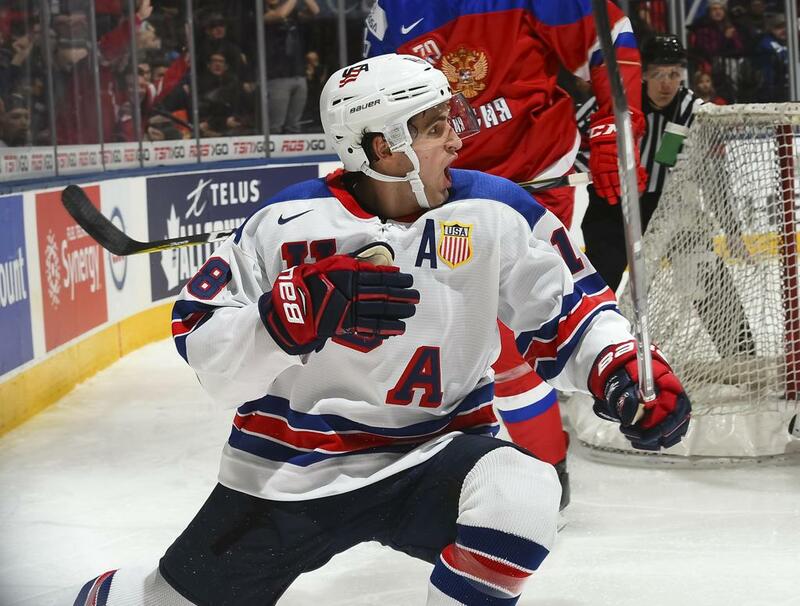 The U.S. opened the game with a six-goal first period. Reilly Walsh (North Falmouth, Mass./Harvard Univ.) started the scoring just 2:46 into the game when his shot from the top of the right circle beat Belarus goaltender Rodik Dmitriy. The play started when Max Jones (Rochester, Mich./London Knights) took a pass from Quinn Hughes (Orlando, Fla./Univ. of Michigan), skated down the left wall and around the net before dishing the puck back to Walsh for the game’s opening goal. Casey Mittelstadt (Eden Prairie, Minn./Univ. of Minnesota) doubled the scoring at the 7:30 mark when Scott Perunovich (Hibbing, Minn./Univ. of Minnesota Duluth) stopped a Belarus clearing attempt and found Mittelstadt between the face-off dots for a quick-wristed shot for a 2-0 lead. The U.S. connected again with 10:57 remaining after Hugh McGing (Chicago, Ill./Western Michigan Univ.) skated the length of the ice and sent a pass to the trailing Phil Kemp (Greenwich, Conn./Yale Univ.) for a 3-0 advantage. Just over a minute later, Kieffer Bellows (Edina, Minn./Portland Winterhawks) scored his first goal of the game by finishing a 2-on-1 attempt off a feed from Tufte. Tufte made it 5-0 with 6:38 remaining when he took a drop pass from Mittelstadt and beat Dmitriy with a snap shot from just inside the blue line. Mikey Anderson (Roseville, Minn./Univ. of Minnesota Duluth) accounted for the sixth U.S. goal when he was able to tuck a cross-crease pass from Logan Brown (St. Louis, Mo./Windsor Spiftires) just inside the left post. The middle stanza saw the U.S. add four more goals, including a pair just over five minutes into the frame. Hughes connected first with a long-range shot off a pass from Brown at the 14:33 mark before Bellows tallied just :11 later on an unassisted effort. With five minutes remaining in the frame, St. Louis natives Brady Tkachuk (Boston Univ.) and Trent Frederic (Univ. of Wisconsin) each added goals to give the U.S. a 10-0 lead entering the final stanza. In the final period, Norris tallied a pair and Kailer Yamamoto (Spokane, Wash./Spokane Chiefs) and Tufte also scored to account for the 14-0 final.